Retrieve data from both 2.5" and 3.5" SATA hard drives with the EZD-2535U3 Hard Drive Duplicator Dock from Kingwin. Simply insert the SATA hard drive into this top-loading dock to quickly transfer your data to both Windows and Mac based computers. 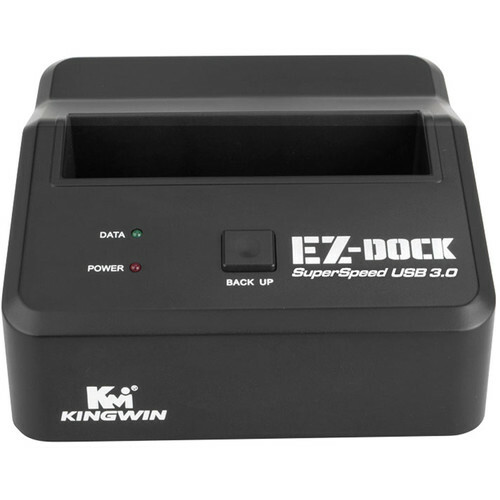 The integrated USB and eSATA connections on the back of the dock allow you to transfer data to and from the drive quickly and efficiently. In addition to the typical backup procedure, you can also utilize the one-touch backup button which simplifies the backup process. With hot-swap support the drives can also be removed and replaced without shutting down the computer or disconnecting the dock. Box Dimensions (LxWxH) 6.0 x 5.8 x 5.3"
EZD-2535U3 Hard Drive Duplicator Dock is rated 4.0 out of 5 by 1. Rated 4 out of 5 by Big Jack from Works well Bought this dock on recommendations of other buyers... works well. I would like so see a little more physical support for 2.5 or even for 3.5 inch drives since it lets them wobble a bit, but it worked fine otherwise. what is the voltage of the power supply ?